In sudden rage. Then calm, slow. The anger boiling deep below. 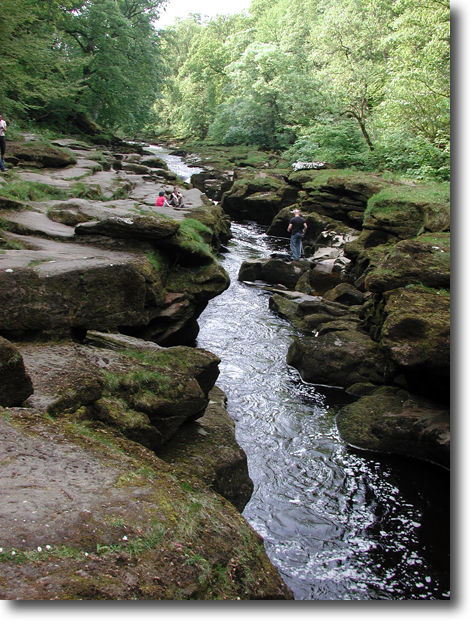 This place is called The Strid. By he who dares The Strid to stride. Its mouse alive, before it’s lost. The mere, its ancient lore to keep. The souls of those The Strid has claimed. Adrift on a carefree summer breeze. Brash, but sometimes ‘rough’ appealed. Of these two blended for the tongue? At the stoney Strid, the birchen glade. Our first words shared, our first games played. Let’s kiss once more beside The Strid’. She felt the flames, the love anew. She felt the fire burn deep within. He pushed her once, and she fell in. What tragedy befell their tryst. Below The Strid, and down she sank. The white horse screeched a haunted death. And, holding hard her precious breath. Her anger rose, and she had won. At submerged walls. She climbed, then slid. A roar to drown even The Strid. She climbed an age and breathed again. To evening cries of water birds. High beyond her watery hell. An aged man and a labrador. Only guilt of innocent surrender. And aged owner, off she set. Two gritstone streets she trudged, no more. She met her husband’s eyes. We wonder who was most surprised! The man? The dog? The heroine? Would fall as love healed what was riven. In time, the two were reconciled. And scent the wooded Wharfe today. The Strid is a short but notoriously dangerous stretch of water on the river Wharfe near Bolton Abbey in the beautiful scenery of The Yorkshire Dales National Park. The depth of the river at this point has never been established, but it is thought there are large underwater caverns, from which it is impossible to escape once pulled down. While this narrative poem has much poetic license, the gist of the tale is true. In the 1950s a man attempted to murder his wife by pushing her in. Miraculously, she lived, and was swept downstream, becoming the only known survivor from a fall into these waters. Even more bizarrely, she forgave, dropped charges, and the two were eventually reunited. Local lore has it that a ghostly white horse rises from the depths every time a death occurs.The veracity of this is still in question.